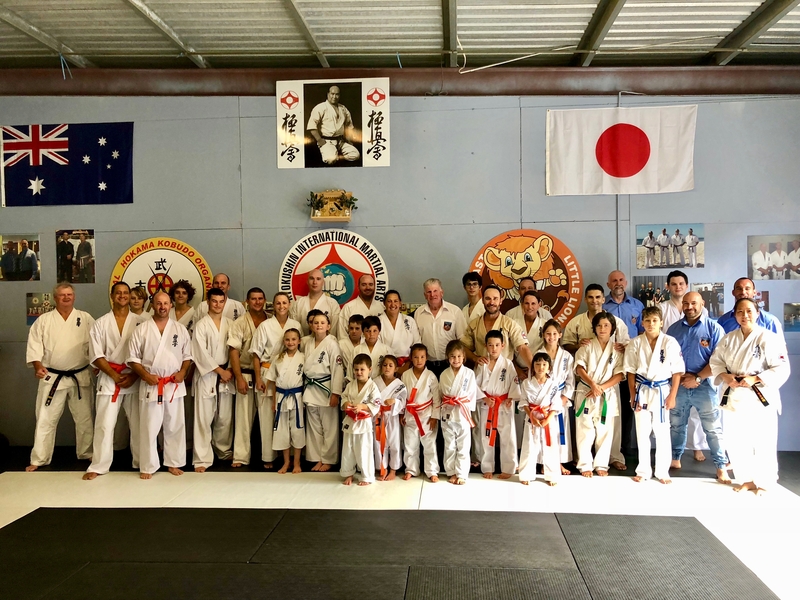 On the weekend of May 5-6, the second KIMAA seminar of the year was held at the Far North Coast NSW dojos. Students from the North Coast dojos led by Sensei Mark McFadden and Sensei Jon Ellis attended in large numbers. A small contingent from Queensland, led by Sensei Rob James, travelled down for the weekend, too. 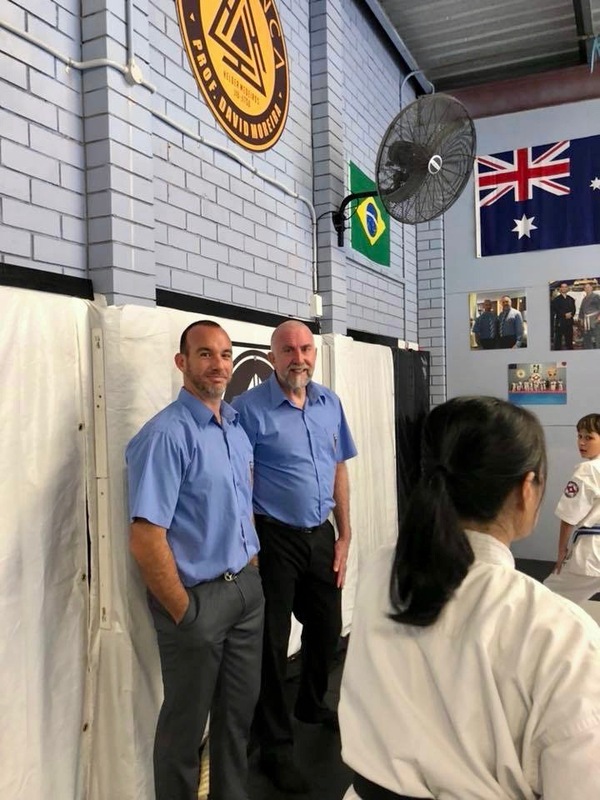 Leading the seminar was Hanshi Howard Lipman, who flew up from Sydney on the Friday for the event with Sempai Alex Lloyd. Seminar black belts: Sempai Wally Gray, Sensei Jon Ellis, Hanshi Howard Lipman, Sempai Alex Lloyd, Sempai Patricia Tan and Sensei Rob James. Saturday morning kicked off at Sensei Jon’s Ballina Dojo. Adults and Little Lions came together to for the general class in kihon (basics) and kata (pattern) under Hanshi. Strikes, blocks and kicks were practised at length, examining the finer points of each technique. The students gained a new appreciation for how much goes into every aspect of Karate. They next applied these tips for technical precision into fighting drills. The class also performed some kata, and learned new partner-stretching moves. Wesley Snider of Lismore Dojo tests his flexibility in the North Coast KIMAA Seminar. That afternoon, a class for senior grades and a select couple of juniors was held at Sensei Mark’s Lismore Dojo. Hanshi continued the fighting drills lesson from the morning before Sempai Alex led the group through various kata: Yantsu, Pinan sono Go, Naihanchi and various kata in Ura. A few senior basic techniques were revised before the session finished. Jermaine Downs, of Brisbane Dojo, at the North Coast KIMAA Seminar. Sensei Jon and his wife Tabby generously held a group dinner at their home in Ballina. 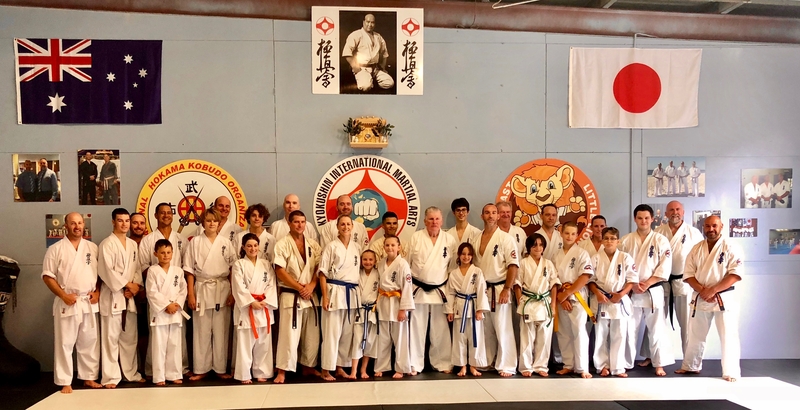 Sunday featured a three-hour Kyokushin grading for junior adult kyu grades and the Little Lions. Hanshi Howard, Sensei Mark, Sensei Jon and Sensei Rob assessed the students while Sempai Alex led the grading. It was an intense morning, technically focused, fast and entailed a large number of push-ups. Hanshi was delighted to pass everyone who attempted the grading. Students were awarded their belts that day. Special congratulations go to Blayne and Anthony, who were double-graded to senior yellow belt (5th Kyu). Special mention also must go to 1st kyu Jermaine Downs of North Brisbane Dojo, who exhibited excellent form over the weekend. The karate class after the grading on Sunday. 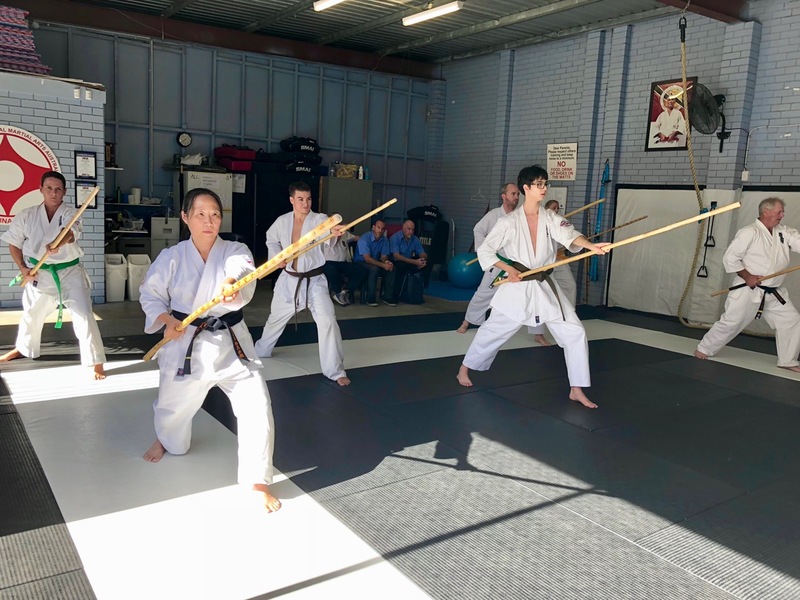 A Kobudo class was conducted after the grading for interested students. Sempai Alex took the group through the finer technical points of the Bo staff, focusing on basic strikes as well as the first exercise and Kihon kata. Sempai Trish and Wesley lead the Kobudo class. Sensei Jon Ellis and Sensei Mark McFadden during the grading. It was an outstanding weekend organised by Sensei Jon and Sensei Mark. 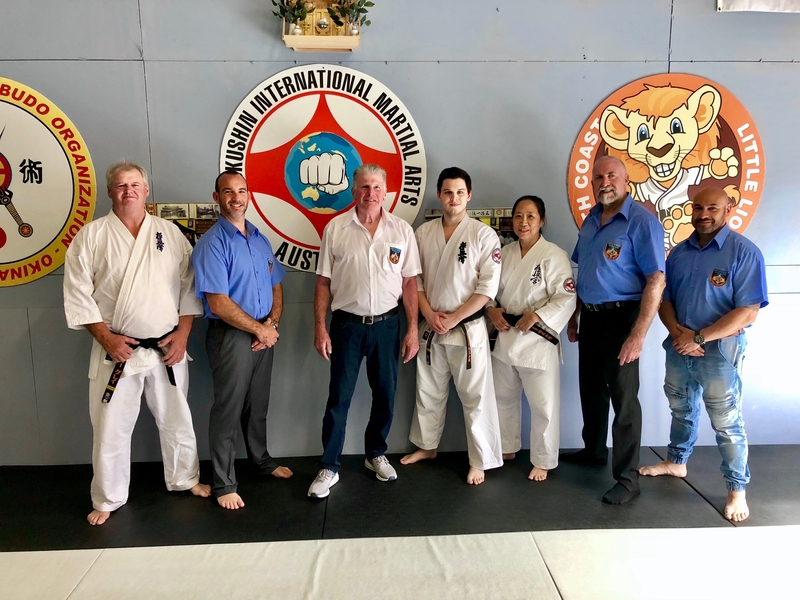 Thanks go to the North Coast dojo operators for use of their facilities, and to Sempai Wally Gray, Sempai Patricia Tan and Larissa Watson for their assistance as well. 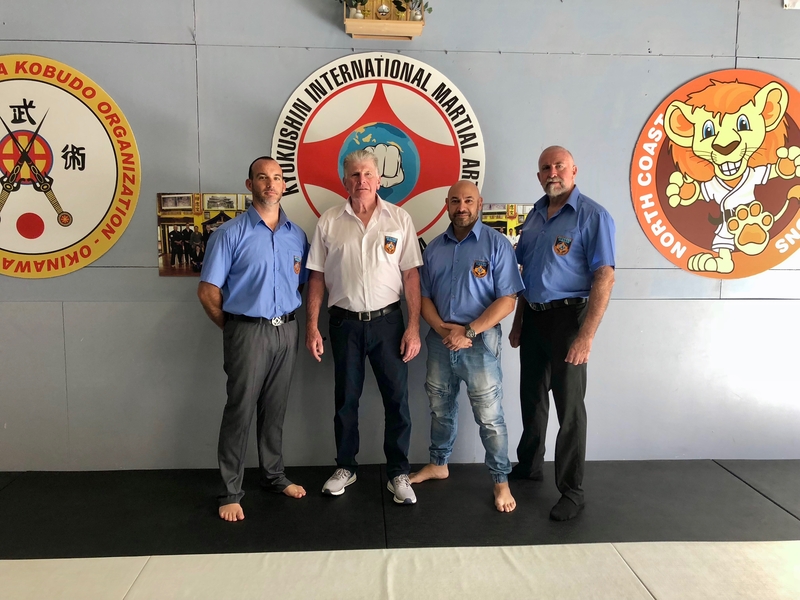 The North Coast students who don’t normally get to make the trips to Sydney enjoyed the opportunity to train with the head of the organisation, Hanshi Howard Lipman, which made it a memorable experience for all. Dojo operators Sensei Jon Ellis, Sensei Rob James and Sensei Mark McFadden with KIMAA Chairman Hanshi Howard Lipman.